Yesterday I was talking to a friend and she asked me what gluten was. I gave her a pretty simple answer- what causes bread to rise. But, it is really more than that. It is what makes dough stretchy. It’s what gives cookies structure. It is why bread rises so much. The yeast helps, but it needs gluten. If your flour doesn’t contain gluten, the results are different. To get the same effect, you may need to add more eggs or use a flax seed slurry, xantham gum, or guar gum to mimic the effects of gluten. In Going Gluten Free part 1 & part 2, I gave you a general idea of what you need to know to be gluten free. Now,I am going to tell you what gluten is. Gluten is made up of two proteins- the gliadins and the glutenins. When they come together, you end up with the texture you want in breads, cookies, and cake. The protein gliadins is the major trigger for celiac disease. There are three subtypes of gliadins. They are a/B-gliadins, y-gliadins, and w-gliadins. Glutenins are basically what causes the rising or structuring effect. It adds in air and is why the crumb in your baked product is the way it is. Wheat is the major producer of gluten. The amount of gluten does vary from strain to strain of wheat. The ancestors of modern wheat, emmer and einkorn, contain far less gluten. Gluten is also present in barley, rye, bulgur, kamut, or triticale. Oats do not contain gluten, but may be cross contaminated if processed in a facility where gluten products are being processed. 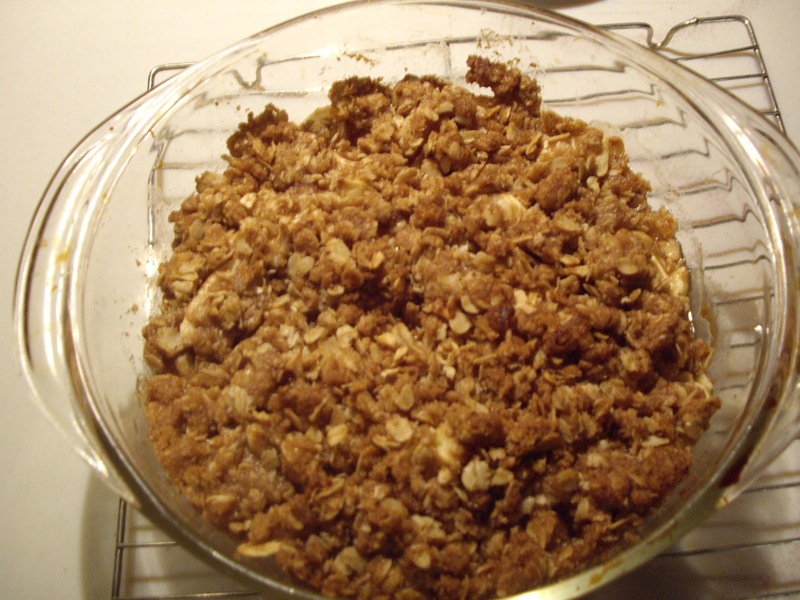 This apple crisp is a little different than most. It is made with all oats instead of oats and flour. If you would like flour, you can blend half the oats in a blender until you get oat flour. You will need a 1-1/2 to 2 quart casserole dish. In a medium size bowl, mix the brown sugar, nutmeg, cinnamon, and oats. Add the butter and cut in until crumbly. Core, peel, and slice the apples and place them in your dish. 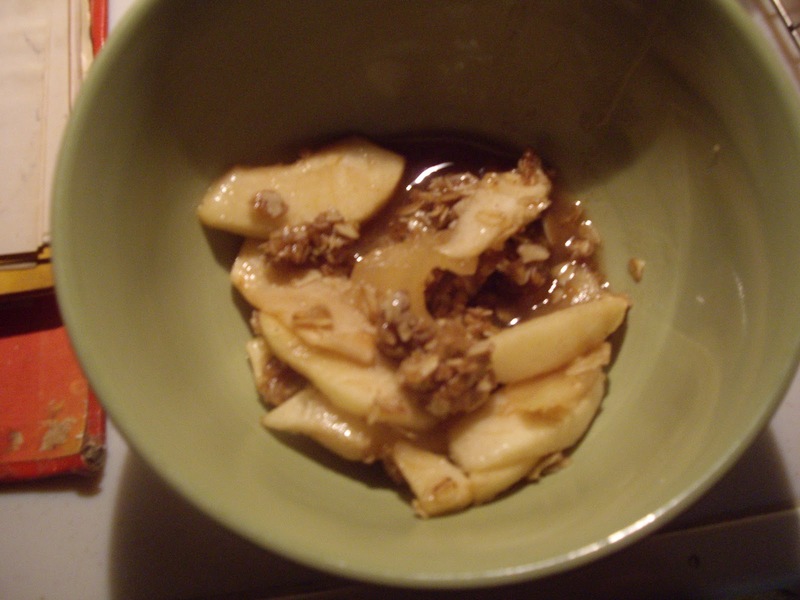 Sprinkle the brown sugar topping over the apples. Put in the preheated oven for 30-45 minutes or until the apples are tender when pierced with a knife. You will get 4 nice servings. Six, if they are smaller. If the apples are really juicy, you may get some juices pooling at the bottom. Just spoon some over the top of your crisp. Amazing! 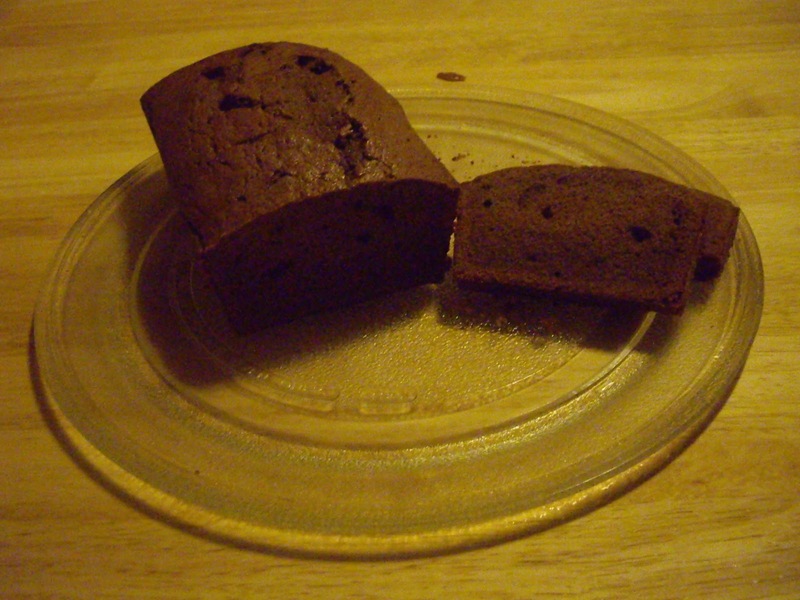 This is great if you are wheat free or even have problems with gluten. If you have celiac disease, you may need to find certified gluten free oats. Most people that are gluten sensitive can tolerate oats, but there may be some cross-contamination with wheat or barley during processing. This taco sauce is really simple to make. 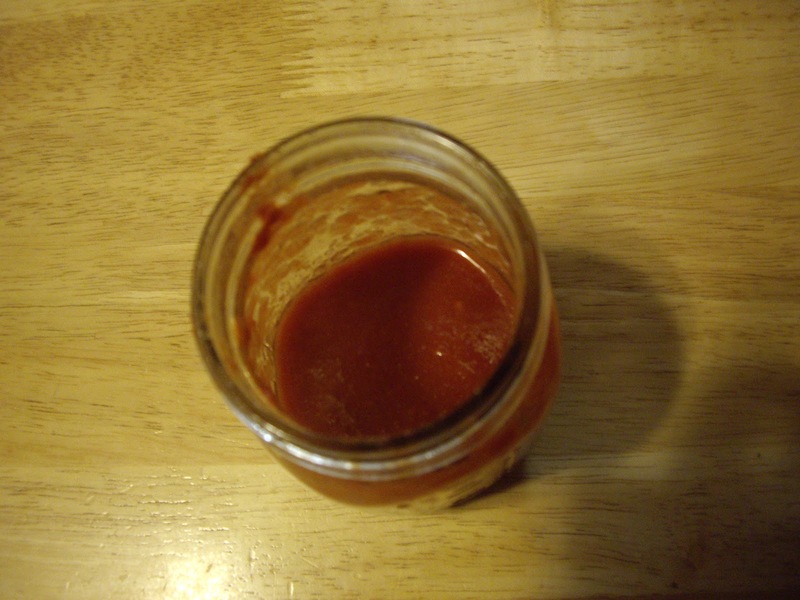 So, next time you are making something that you want taco sauce for and you don’t have any-make some. I don’t always have taco sauce on hand. But, I always have canned tomatoes and spices. You will need a blender. I use a hand held immersion blender. You will need a small or medium size saucepan. Blend the tomatoes until smooth. Combine in the saucepan with the rest of the ingredients. Continue simmer for about 30 minutes or until as thick as you like. This will make about 1-1/2 cups. It will keep in the refrigerator for a few days up to a week. The thicker it is, the hotter it will be. And remember that it will thicken a little upon cooling. This is not really hot, but it does have some heat to it. If you want it milder, start off with half the amount of cayenne and taste before adding the rest. These blueberry muffins are a little different from most homemade blueberry muffins. This version not only has buttermilk, but it is sweeter and has vanilla extract. It is more like a blueberry muffin you would buy from a bakery or even the little Hostess muffin bites. If you don’t have buttermilk, pour 1/3 cup vinegar or lemon juice into your liquid measure and fill it up the the 1 cup mark with milk. Let stand 5 minutes before using. 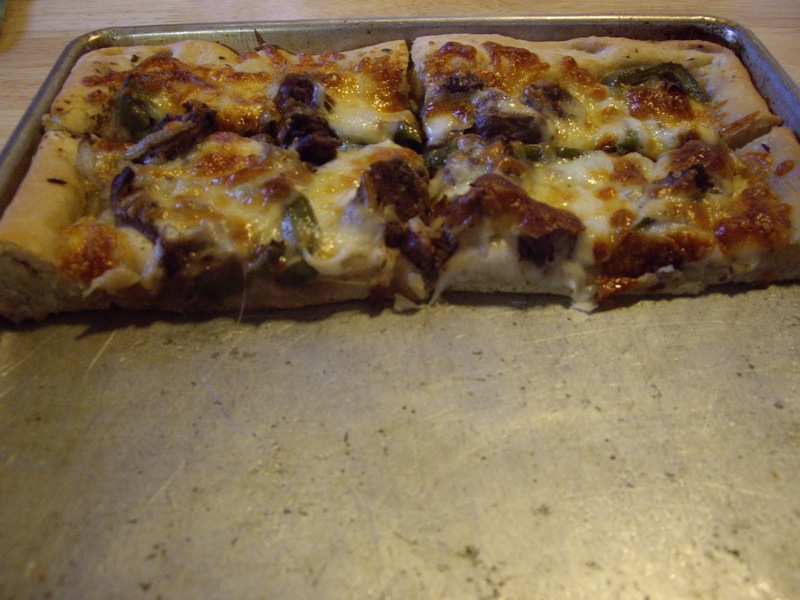 Preheat your oven to 375 degrees Fahrenheit (190 Celsius). Grease 12 regular size muffin cups OR line with cupcake liners. In a mixing bowl, blend the flour, baking powder, baking soda, salt, and sugar. In another bowl, beat the buttermilk, egg, oil, and vanilla extract. Pour that mixture into the flour mixture. 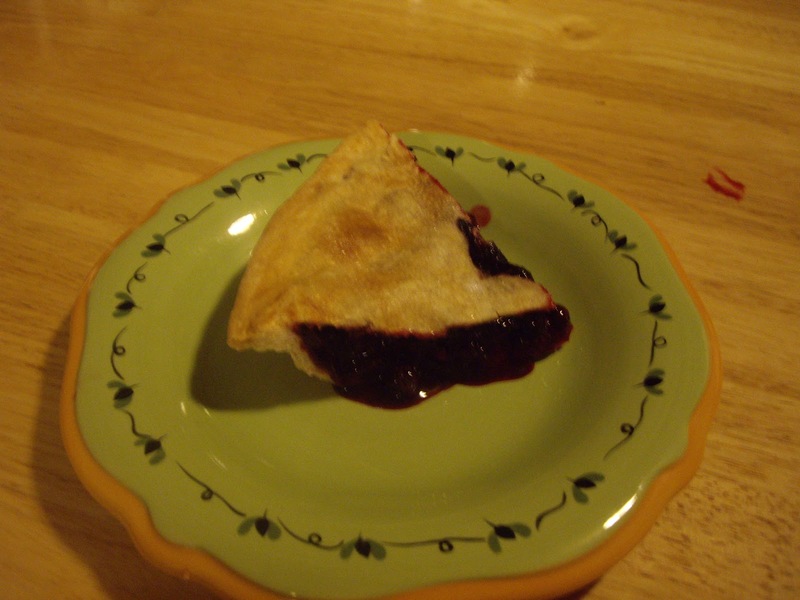 When it is well moistened, fold in the berries. Don’t overmix or your muffins will get all pointy in the oven and there is the possibility they could be tough. 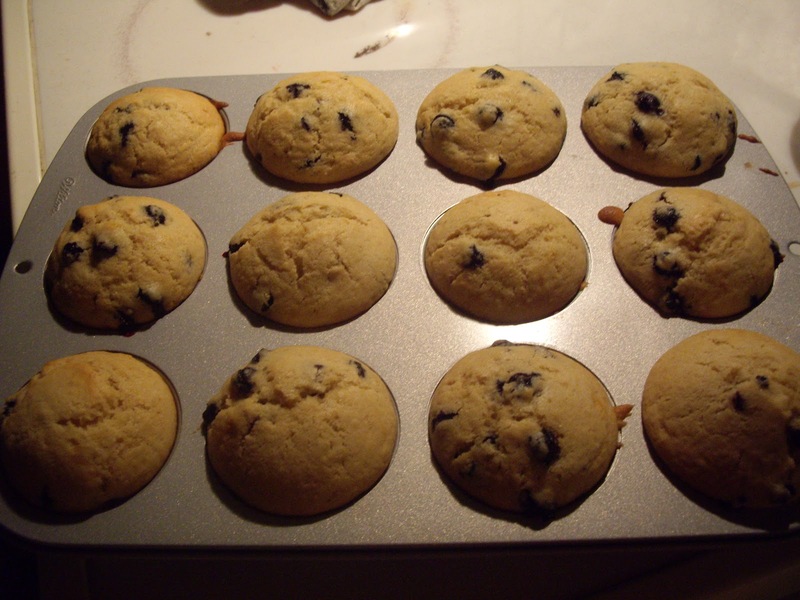 Also, if you use frozen berries and you mix too much, melting starts and you get purplish swirls throughout the muffins. Divide the batter evenly between the muffin cups. Each cup will be almost full. Bake for 20-25 minutes or until they test done when poked with a toothpick. Let stand for 5 minutes. Remove from pan. If you have olive oil, I really recommend using it. The muffins are very light. One of my favorite parts of growing bell peppers is making stuffed bell peppers. This soup is a great way to get the flavor of stuffed bell peppers in a comforting bowl of soup. 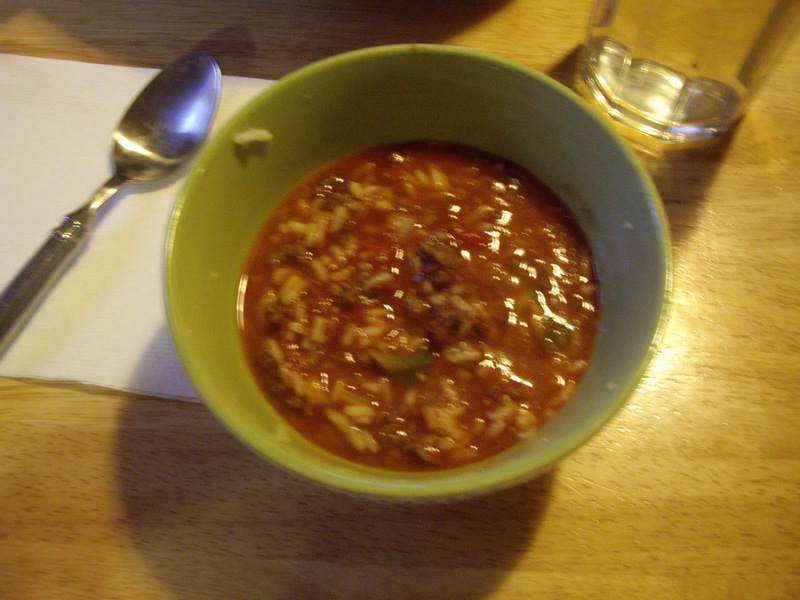 If you happen to grow your own peppers, slice or chop some and freeze for making this soup. They work great! You will need a Dutch oven or large pan for making soup. Brown the ground beef in your Dutch oven. Drain off fat, if needed. Add the onion and peppers. Cook about 5 minutes until the onion is tender. Add the tomatoes, paste, broth, thyme, and sage. Cover and simmer until the peppers are tender. Fresh peppers about 30-40 minutes. Frozen peppers will maybe take about 20 minutes. In a medium saucepan, add the rice to the water. Bring to a boil and reduce heat to low. Cover and cook approximately 15 minutes or until water is absorbed. Remove from heat. Add the rice to the soup and heat through. Taste and season with salt and pepper if you want. Tastes great with shredded cheddar cheese sprinkled over the top. You will get 6 filling bowls of soup.